Nelson Mandela Metropolitan University‘s new BEd Foundation Phase building at Missionvale Campus. 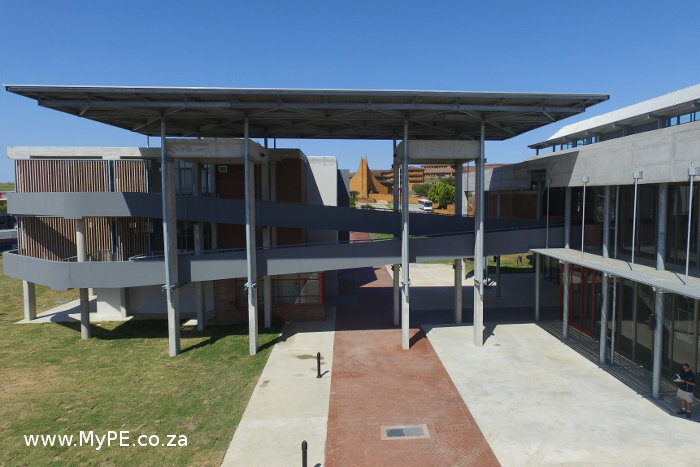 Nelson Mandela Metropolitan University is officially launching its brand new education building on its Missionvale Campus, which has been custom-built for students studying towards a BEd Foundation Phase degree, on April 4. The new building is geared around the Faculty of Education’s re-curriculated Foundation Phase programme, which is part of NMMU’s significant efforts to grow the number of Foundation Phase teachers in South Africa, to address teacher shortages in this critical phase. These teachers are responsible for the educational foundation of children from Grade R to Grade 3. How and what they teach, and how they engage in the classroom, profoundly influences the life path of these children. “Where the Foundation Phase is concerned, we have to get the message out there that if we do not get the foundations or basics right, the rest of the building is not going to stand,” said Executive Dean of Education Dr Muki Moeng. The new building is positioned at NMMU’s Missionvale Campus (a shift away from NMMU’s South Campus in Summerstrand), where it is better placed to reach the schools where strong Foundation Phase teachers are needed most. The Education Faculty’s new curriculum is underpinned by the Reggio Emilia philosophy of child development, which places emphasis on using drama, music, art and language to tap into the full potential of each child. It is the antithesis of a “one size fits all” teaching approach. Although the official launch of the building only starts at 11am on Monday, the 400 students in the Foundation Phase programme will be involved in interactive workshops from 9.30am, which have been inspired by the Reggio Emilia philosophy. These include creating giant puzzles, where students from each year of the four year degree course will write or illustrate what their hopes and dreams are for Foundation Phase teaching in South Africa. The puzzles will be put together and laminated, becoming four permanent murals in the building. “We want our students to take ownership of the new building – to feel part of this space – and the giant puzzle murals is one of the ways we are doing this,” said NMMU’s Programme Head for the Foundation Phase, Dr Deidre Geduld. The students will also have an interactive music workshop led by Spanish-born Pedro Espi-Sanchis, who lives in Cape Town and specialises in instrumental African music. Dr Moeng will start the formal proceedings at 11am, welcoming the guests. Vice-Chancellor Prof Derrick Swartz will deliver the keynote address and there also will be short talks by Missionvale Campus Director Dr Phakama Ntshongwana and Deputy Vice-Chancellor: Academics Prof Denise Zinn. In between the talks, there will be several musical interludes, including one by Espi-Sanchis with soloist Miranda Ncwane and another by Port Elizabeth musician Gareth Williams, from TwoTone Music. A video of the development of the building will also be shown. The unveiling of the plaque by Prof Swartz will officially opening the building – and guests will then have the opportunity to walk through the new building. Key features include spacious, versatile lecture rooms with movable furniture, which can be used for lectures, music, drama and meeting rooms. They can also be utilised for afterschool programmes, such as literacy development.